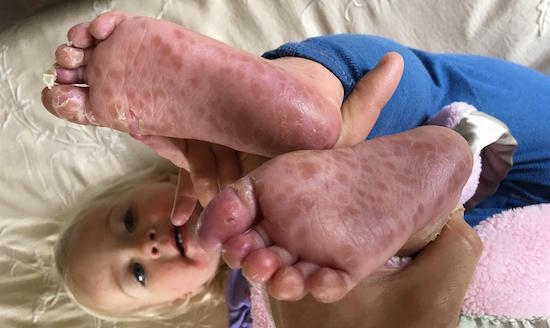 A variation of coxsackievirus, called Hand Foot and Mouth Disease, is affecting many children, doctors say. The airborne virus is highly contagious and causes those affected to develop blisters on their hands, feet, and mouths. These lesions can be accompanied by a fever, sore throat, and severe discomfort. Although people of any age can catch it, the virus is especially common among very young populations. “Eventually, 100% of the children will be exposed to the coxsackievirus virus,” says Dr. René Bravo of Bravo Pediatrics. However, this does not mean all children will develop symptoms. About 20% of those exposed to the virus will catch it. Dr. Bravo recommends that children who catch the virus be taken out of school or daycare to prevent the spread of the disease. “Wait until the blisters heal, and no new one show up, and then you are welcome to come back to daycare,” says owner of Little Blossoms Daycare and Preschool, Beth Stireman. Although there is no immediate cure, at-home treatments can be used to make the affected person more comfortable. According to Dr. Bravo, over-the-counter medicines like Tylenol and Advil can help with pain, while calamine lotion can help calm the skin. If you suspect your child has hand, foot and mouth disease, take a picture on your phone and email it to your pediatrician to save yourself a trip into the doctor’s office.